•New methodology that goes from Bible text to rules and not the old fashioned, painful system that focuses on dry abstract rules! 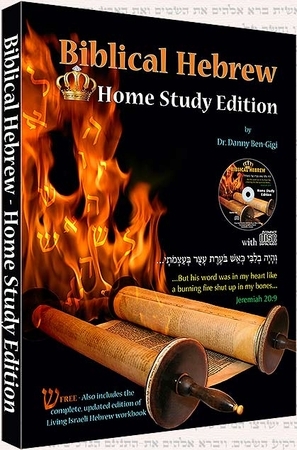 •Includes FREE, a full color complete, updated and extended edition of Living Israeli Hebrew book (14 additional essential pages that go far beyond the older B&W edition). Now also includes the most important Hebrew prayers. •THE 100 MOST FREQUENT WORDS IN THE BIBLE, translated and transliterate (with phonetic text - Hebrew words spelled with English characters). •Two full length audio CD closely following the Hebrew texts of both books. •Hebrew / English two-sided flash cards for both the alphabet and the Hebrew sound system. The most anointed teachings available!